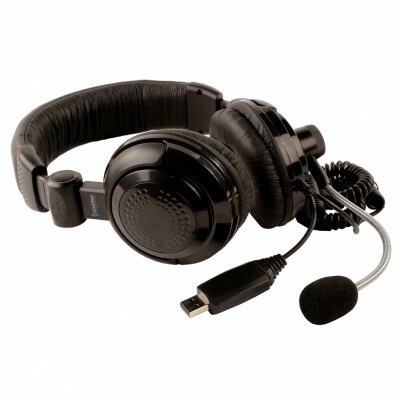 The 41320 headsets have been designed, rigorously tested and tuned, with its own built in sound processor consistent results are achieved, the plug & play universal drivers allow simple usually fully automatic connection to modern computers from Windows XP onward including Windows 10. Accurate audio reproduction: Powerful but perfect crystal clear sound, efficient crisp response across the audible frequency, the acoustic tuning allows you to truly experience full frequency of sound with ample loudness without distortion but with a satisfying Bass. They provide very accurate audio reproduction for a rich, clear and dynamic sound only to be replicated in very expensive Hi-Fi sets. Robustly designed but comfortable: The 41320 stereo headphones have a comfortable sturdy headphone design. The soft cushioned ear pads are angled to gently follow the contour of your ears so that they don't 'bleed' sound to distract adjacent people and minimise background distractions. They have left & right markings to ensure correct phasing of listening. An adjustable, cushioned headband distributes weight evenly across the top of your head. Together, with the ear pads, they help provide hours of continuous and comfortable listening. These headphones are a simple fold up design for easy storage. Versatility: The microphone is mounted off the earpiece by a flexible but stay-put mount. This allows the positioning of the microphone for the personal choice of the user. The quality and range of pick up are impressive. It allows the headset to be used with language software, voice recognition software, gaming and Skype, etc.